Washington State coach Mike Leach has been among the most vocal opponents of the NCAA Council’s recent decision to eliminate satellite camps. Leach appeared Monday on Sirius XM College Sports and was asked by show hosts Jack Arute and Andy Staples if Michigan coach Jim Harbaugh had upset the college football establishment and this vote was the end result. Harbaugh and his staff took Michigan last summer during an extensive nine-city satellite camp tour to high school football players who might not otherwise be able to afford a visit to the Ann Arbor campus. Certainly, he also used the opportunities at these camps around the country to identify prospective recruits. That drew the ire of coaches in the SEC and ACC because those conferences do not allow their coaches to work camps outside a 50-mile radius of their schools. The NCAA approved Friday a proposal by the ACC to forbid universities to use secondary sites for camps, so satellite camps are no more, effective immediately. According to ESPN, the Big Ten, AAC, C-USA and MAC conferences voted to keep the camps, while the ACC, Big 12, SEC, Pac-12, MWC and Sun Belt voted for the proposal -- to ban them. “It sounds to me a whole bunch of people need to worry about what they’re doing instead of what Jim Harbaugh is doing,” Leach told Sirius XM College Sports. 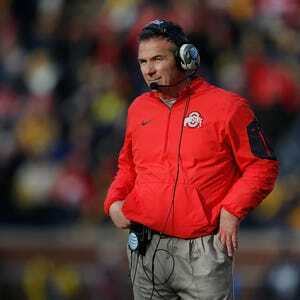 “They need to coach their team and let Jim Harbaugh coach his. If Jim Harbaugh wants to do satellite camps, great. If he wants to do satellite camps wherever he wants to do them, great. “Look at it this way, in our case, Los Angeles, in south central LA, there are going to be kids, UCLA is going to fill up not need somebody at this position, USC is going to fill up and not need somebody at this position – and then all of a sudden some kid is sitting there, I mean a quality kid who can play Pac-12 football. You don’t think it’s pretty important to that kid to have exposure to Washington State, Washington, Utah, Oregon State, Oregon, Arizona and Arizona State. You don’t think that means something to him? Leach said he is dumbfounded the Pac-12 representative voted down satellite camps. He said with the exception of UCLA and Stanford, the Pac-12 programs were on board. “The voting process, that’s a rabbled-up mystery too,” Leach said. “From what I understand, this is befuddling, and I do plan to find out because our conference voted to eliminate satellite camps, and yet the vast majority of schools in our conference were in favor of satellite camps. Leach believes there are only two possible reasons for voting against satellite camps.